Observation - Unidentified duck - UK and Ireland. Description: Rather handsome duck, green and purple iridescent plumage. This is the only duck like this on our local pond and has been there for over 2 years now. Is it an escapee? Can anyone help identify it please. 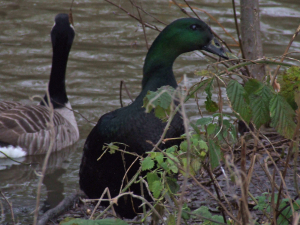 Rather handsome duck, green and purple iridescent plumage. This is the only duck like this on our local pond and has been there for over 2 years now. Is it an escapee? Can anyone help identify it please.